New York-based SHoP Architects has been named as this year’s winners of the Panerai Design Miami/ Visionary Award. Now in its third year, the award recognized SHoP for their “bold, evocative architecture, philanthropic initiatives, sustainable development, and innovative practices/entrepreneurship.” As a result, the firm will get to see their installation, Flotsam & Jetsam built in the Miami Design District’s Jungle Plaza. In their 20 year history, SHoP has had projects built across the U.S. but has found most success in New York City. Currently, a super tall mixed-use tower is going up in Brooklyn—the borough’s first. Using Chattanooga-based 3D printing and fabrication firm, Branch Technology, Flotsam & Jetsam looks to push the boundaries of the 3D-printed medium (especially in terms of scale). The installation—stylistically reminiscent of work by Marc Fornes & Theverymany—sees a series of arching bamboo legs join to form a canopy and seating area. The bamboo however, is no ordinary bamboo. SHoP chose Oak Ridge National Laboratory (ORNL) to supply a biodegradable bamboo 3D print medium. 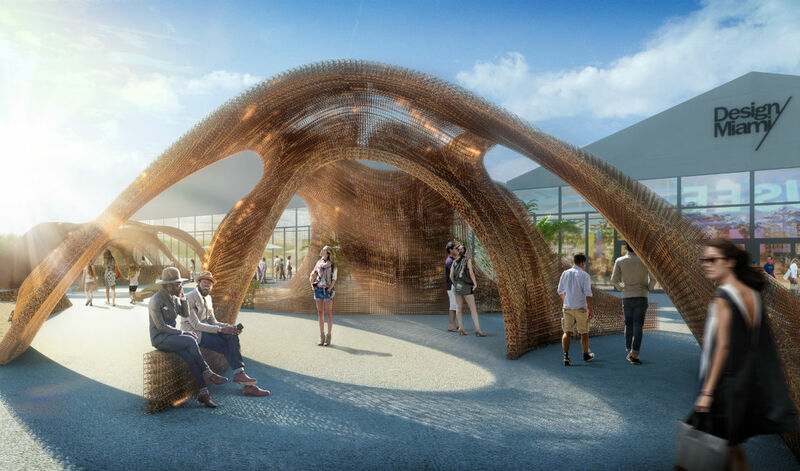 This method of construction can produce forms on an unprecedented scale, and when built, SHoP’s Flotsam & Jetsam will be the largest 3D-printed structure in the world. Located in the Jungle Plaza, the installation will play host to an outdoor cultural event space. Here, talks, performances, and cocktail events will take place. SHoP’s work will also be launched with the Institute of Contemporary Art, Miami (ICA Miami) in Spring/Summer 2017 along with a community program for bringing “world-class” public sculpture to the city. SHoP will be presented with their award at the Design Miami/ press reception on Tuesday, November 29.